Feeling fragile? In bits? Falling to pieces? Need to be glued back together? I think this is the only color photograph of Sidney that I’ve ever seen, and it’s a glorious montage. 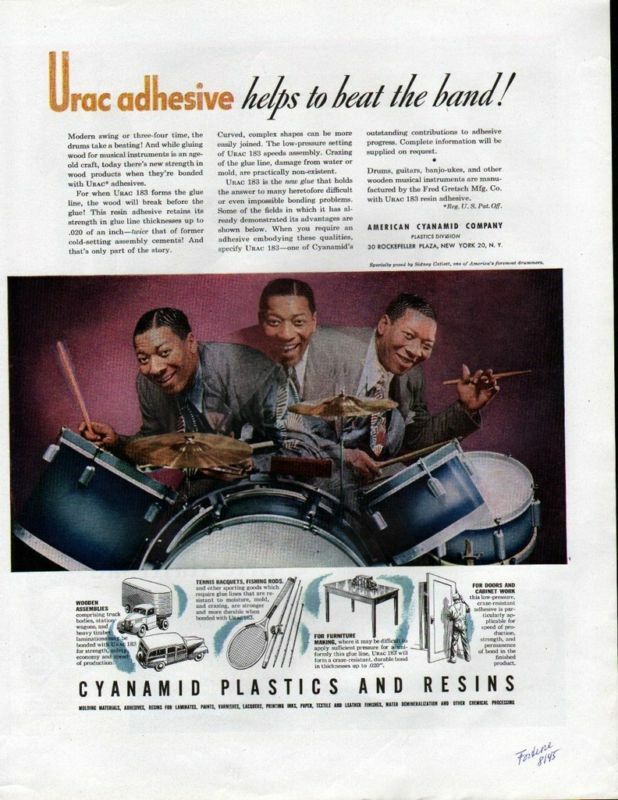 Before I saw this ad, I wouldn’t have gotten all that excited about plastics, adhesives, and resins — now I can’t get enough! Courtesy of eBay, of course! THE MUSICIANS GIVE US SO MUCH: CLICK HERE! Aspiring novelists in Creative Writing classes are told, “Write what you know.” In jazz, musicians play what they know; they live what they know. And sometimes they sign autograph books with what they know and wish to convey to us. Hence this page inscribed by the inspiring percussionist Ray Bauduc (an artifact now up for bid on eBay). Ignore its message at your peril! Posted in Ideal Places, Jazz Titans, Jazz Worth Reading, Pay Attention! I heard Louis Armstrong the music critic at that dance in Lexington KY, spring 1945. A very clear statement about his loathing for modern music, coming at him like a tornado. Music lesson: For preceding centuries, a song or a complete chorus ended on what’s called the “tonic” – the home key, and the chord that preceded it was called the “dominant”, 4 notes below. Here comes modern, and by 1944 the “dominant” was often replaced by a somewhat purple 7th chord a half-step above the “tonic”. Let’s put our mythical tune in the key of F major; at least 20% of the standard repertoire is in F. Eddie Condon called F “the key of love”. Means the traditional “dominant” chord is C, usually with a 7th. So I’m grooving away with Louis blowing his heart out over the band, and come to an ending, where his up-to-date arranger has modernized things with a G-flat 7th before the “tonic” F. Louis slashes an angry C triad right across it, making him play at least two “wrong” notes, and Louis was incapable of playing wrong notes. “That for your godamned modernism!”.